Kids ESL: All about teaching English to kids! Song: What time is it? 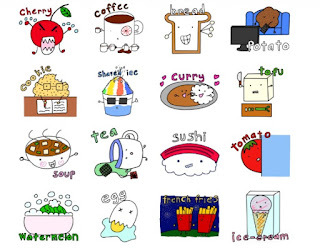 Check out this cute video for learning food words! Remember popular foods in English with this great ebook full or adorable and funny pictures. Primarily aimed at children who are learning English as a second language, it is also suitable for young children who already speak English. 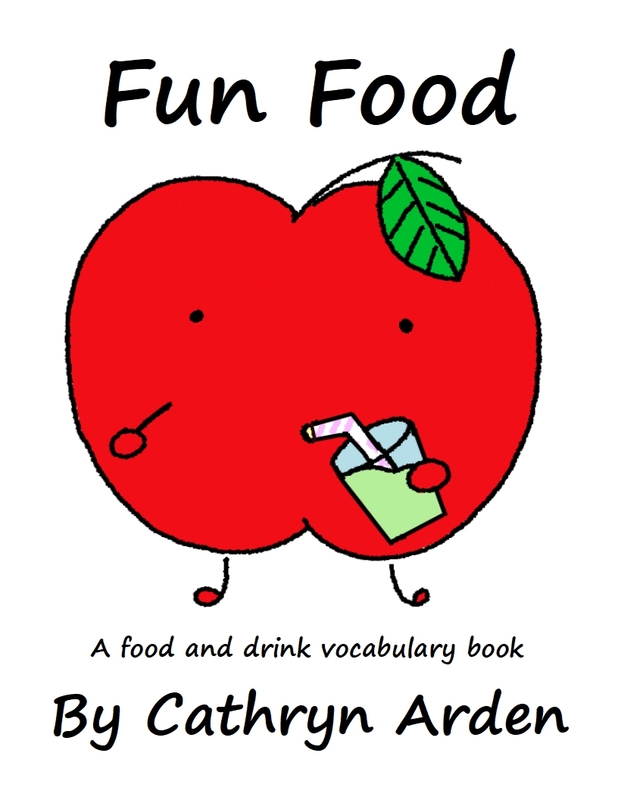 The ebook contains that following foods and drinks. Apple, strawberry, watermelon, orange, banana, carrot, peach, pineapple, eggplant, potato, tomato, pumpkin, egg, bread, rice, cheese, tofu, sushi, soup, curry, pizza, hamburger, french fries, chocolate, cookie, cake, shaved ice, ice-cream, tea, milk, water, meat. Pintrest a popular website where people can collect and share websites, videos, and pictures that they've found on the web. It's also great source of English teaching materials that have been collected and shared by various teachers around the world. Just searching for a topic that you are currently teaching such as verbs, phonics, prepositions, or learning to read, can bring up plenty of worksheets and pictures that you can use in class. You can even open your own account and save the items you like to your own collection. I have also collected various materials on Pintrest and you can check out the Kid's ESL Pintrest page for yourself here. Prepositions are always difficult for students to remember, so why not make it easier with some great songs that will get stuck in their heads for hours. This above song is great for beginners and young children. It even has a niffy dance and repeats the words in, on, under, by again and again to help the kids remember. Click read more to see other great songs to use with your students when teaching prepositions. If you become a teacher you will inevitably encounter students who will refuse to do as they are told and challenge your sanity. They are often quickly labelled "the bad student" but here are some good ideas to help your deal with difficult students, and assist you in getting through those tough times. Lacking resources? Work at a school which expects your to teach English...with nothing? 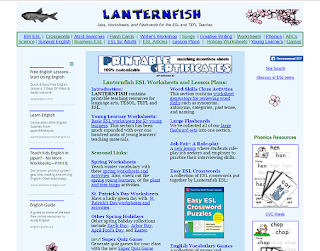 Lanternfish is a great website that I've been using recently. It has plenty of free materials, games, lessons plans, and songs to help you plan your lessons with kids and adults. Read more to learn more about their great stuff. 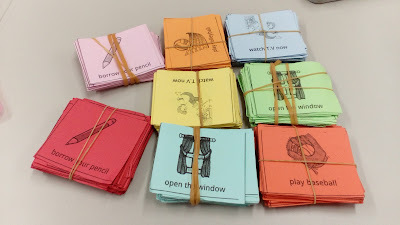 Ever made multiple sets of the same card game for class and then messed them up? Ever finished playing only to fine one lone card sitting on the floor after class? Instead of having to go through every single set to rearrange your cards, why not print each set on a different colored piece of paper or cardboard. It's super easy to print, and makes telling each set apart 100x easier. Many students who live in a non-English speaking country may have few opportunities to speak English outside of class. Their only exposure to English may only be their one hour class once a week, which means it may be difficult for students to retain and remember English words and grammar. Therefore you need to continuously repeat the same words and questions again, and again, and again, and again, in order to make them stick. This does limit the amount of new material that they can learn in a year, but it will benefit the students in the long run. Check out this article to learn more about how to use repetition and keep your lessons fun and interesting. Here is a great chant and video to help students remember the difficult "I am, you are, he is, she is." Grammar in English. It's a great chant to do in class without the music too! Want to use more games in class, but don't know how? Having trouble getting the kids to play properly? Check out this great guide on teaching games and help the kids have more fun when learning English. Starfall is a great free website which has tones of online stories, quizzes, songs, and worksheets to help children learn how to read. It's aimed towards English speaking children who may have reading difficulties, but it's great for ESL learners as well. esl-lounge.com - Communicative ESL Lesson Materials. esl-lounge: Free ESL Lesson Materials for teachers. Grammar, worksheets, song lyrics, board games, pronunciation and more. All free and printable. Kids ESL Games - Printable worksheets & puzzles, phonics pages, interactive esl games, songs for esl, grammar games, vocabulary flash games. ESL Teachers Board: ESL jobs, teaching materials, resources for teachers and students. 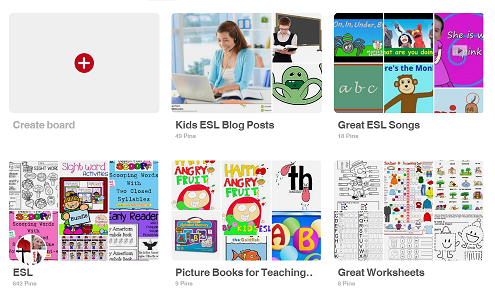 Follow Kids ESL on blogger! Kids ESL. Contact us at contact@kidsesl.net. Theme images by selensergen. Powered by Blogger.